A picture that appears to show the logic board for Apple's next-generation iPad shows a system-on-a-chip labeled "A5X" rather than the "A6" processor that has been rumored. If accurate, the name "A5X" could suggest the next iPad's custom processor is a more powerful version of the existing A5 CPU found in the iPad 2 and iPhone 4S, rather than an overhauled next-generation "A6" processor. 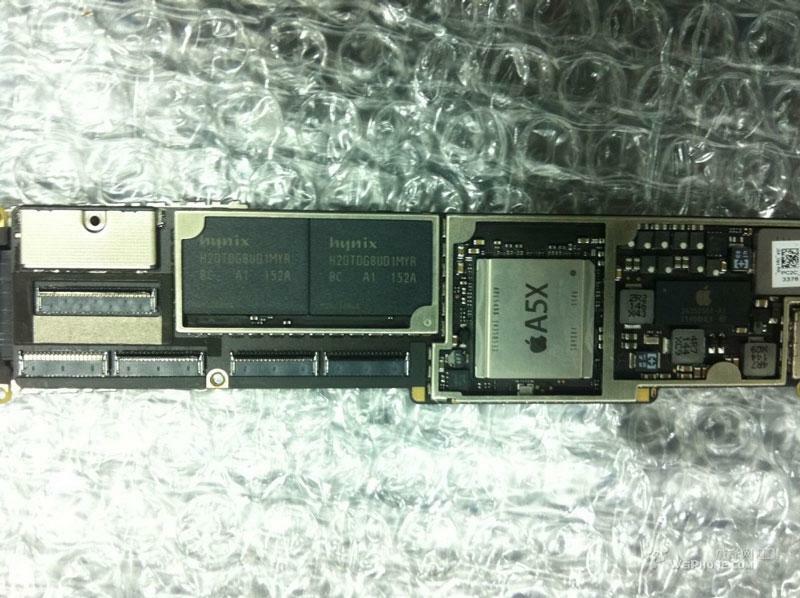 The picture of a purported iPad 3 logic board was first revealed at WeiPhone (via MacRumors). The board indicates the A5X chip was manufactured in November of 2011. It also includes 16 gigabytes of flash memory from Hynix. Apple first began utilizing its own custom chips with the first-generation iPad in 2010. The A4 CPU then appeared later that year in the iPhone 4. The strategy continued in 2011, when the iPad 2 was introduced with the A5 CPU debuting in the iPad 2, sporting a dual-core design and faster graphics processing. The A5 eventually came to the iPhone 4S in late 2011. But the leaked logic board suggests that for the third-generation iPad, Apple will instead use the name A5X. That could support a rumor from earlier this month that claimed the custom processor to be found in the next iPad will still be a dual-core model, not quad core as had been rumored, though it was said it will feature a "significantly more powerful" graphics processor. Purported "iPad 3" parts continue to appear as time ticks down to an anticipated March 7 unveiling of the next-generation touchscreen tablet. Other recent leaks include the external case design, and even a microscope-enhanced look at an alleged third-generation iPad LCD screen, offering further evidence that the device will feature a high-resolution Retina Display.